The 66 Models are in chronological release date order split over seven pages to assist with the speed of displaying images. The background to 66 Models and the various notes are at the beginning of the first page, 1953-1954. Initially released with black radial control wheels (see further below), the example above is the later version. 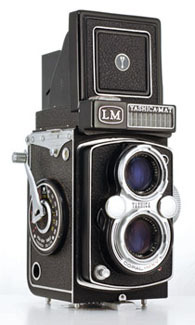 The LM is a Yashica-Mat fitted with uncoupled selenium exposure meter. It is claimed to be introduced in September 1958 (probably based on Corey and/or Japanese Wikipedia) by some and September 1959 by others (probably based on Kahlau or his source) but I believe that based on serial numbers, the example in the user manual, 4110043, is a pre-production example produced in November 1959 and that series production started in February 1960. The black radial control wheels first appeared in mid-1959. On all found in the wild examples, the hood logo is the narrow “Y” on blue background which only first appeared on 66 models at the end of 1959 and the focusing knob is dual scale which was uniformly adopted across all models in late January/ early February 1960. 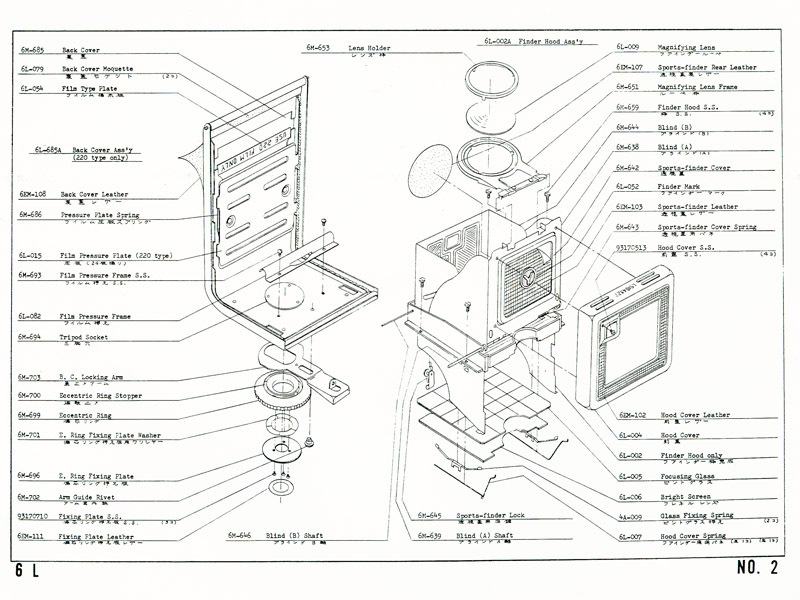 Appearance wise, the user manual (see above) has much more in common with the Yashica Mat-EM than with earlier manuals. Below is part of an ad in the May 1960 edition of Modern Photography. Still seems new. 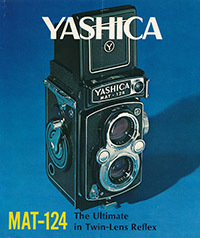 The PDF brochure at the bottom of this section still features the first Yashica-Mat hood logo but already has the distinctive DIN/ASA conversion table on the cover disk usually associated with this model (note however, examples, or more probably the same photo/s, with the early Mat hood logo and Mat cover disk continued to appear in ads/brochures for possibly a year or two). At least there seems to be consensus that it was replaced by the similar Yashica Mat-EM in 1964. There are 111 in my database. The earliest cameras are, 411000x, the Modern Photography ad example noted earlier and the camera in the operating manual, 4110043, with taking lens serial number 220002 and viewing lens which looks like 556452. Until the end of 1960, probably just before prefixed serial numbers start in 1961, viewing lens numbers have a separate series, getting as high as 654xxx. After that time, both taking and viewing lenses have similar numbers. The first production camera in my database has serial number 620xxx with taking lens 221xxx and viewing lens 580xxx. Both this and the operating manual example are the only two with the ® Registered Trademark sign next to the serial number. The next camera has serial number 630xxx with lens number 226xxx. All the cameras until around after 673xxx (with lens number 229xxx) have black radial control wheels. Camera 680xxx received the mat silver wheels already and a later camera with similar number is the last in this number series. Next are two 9 digit numbers, 156090xxx and 156110xxx. Following is the start of the prefix numbers from MTL 1020xxx. 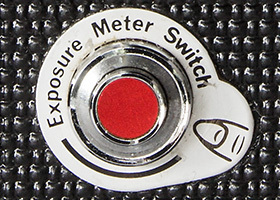 Between MTL 2011xxx and MTL 2020xxx, the metre scale on the dual scale focusing knob changed from yellow to white. Soon after, between MTL 2021xxx and MTL 2051xxx, the two screws adjacent to the exposure window disappeared. At between MTL 2091xxx and MTL 2120xxx (there was a mix in between), the LM lost the screws in the back. The last change was from metal hinged type lens cap to the first plastic tabbed type at around MTL 3040xxx. I believe that the last series production example in my database is MTL 4013xxx, i.e., January 1964, or possibly MTL 4020xxx from February 1964. However, there are more cameras. All these except MTL 4012xxx mentioned below (with late 1962 lenses) have lenses and features that appear to be from mid-1962 or earlier including the two screws near the exposure window, yellow metre scale on the focusing knob and where visible two visible screws in the camera back. The first, earlier January 1964 camera MTL 4010xxx has taking lens number 232xxx and viewing lens 629xxx. Yashica Mat-LM lens serial numbers are very consistent and these look like they are from 1960. The next example is MTL 4012xxx with lens numbers both 368xxx which look like typical late 1962 numbers. Camera MTL 4021xxx has 285xxx lens numbers which look like they are from 1961. Next is MTL 4110xxx and two with MTL 5080xxx numbers. These serial numbers put them a long, long way ahead of the other cameras (November 1964 and August 1965). All three have lens serial numbers which look like 1961 or earlier, one maybe 1960 and the camera with highest serial number still has the black radial control wheels which disappeared in 1960. On the Serial Numbers page, I have argued that these cameras are almost certainly earlier examples fitted with replacement exposure meters (and hence serial numbers) from the official Yashica spares system which may have used a different (higher) range of numbers to identify a replaced item. Original and “new” version with aperture window and relocated flash sync socket. Collectible because it is rare and it is an example of early TLR automation. The technological ancestors of this camera are the Yashica Future 127 development prototype and the 1961 35mm production model, the Flash-O-Set. The best thing that can be said about this camera is the fitting of Yashinon lenses. Or maybe not. As with the Yashica Auto, the viewing lens is f/3.5 so there is a definite budget element here and the same questions arise. There is evidence that both lenses are actually triplets and this is not surprising as the Flash-O-Set has a 40 mm fixed focus 3 element Yashinon. 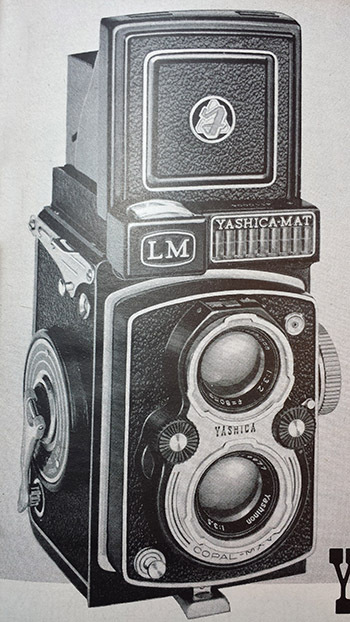 Also, a 1959 Japanese brochure confirms that Yashica 44LM Yashinons are 3 element so the precedent is clearly established. For the first time, neither lens has a serial number. Fixed single shutter speed of 1/60 and Selenium cell controlled and powered fully automatic aperture. This feature is now unlikely to work and if it does, not accurately. There is an override for setting the aperture manually. According to the user manual, the “electric eye” is deactivated by moving the aperture lever from “Auto” to one of the f/ stop positions. 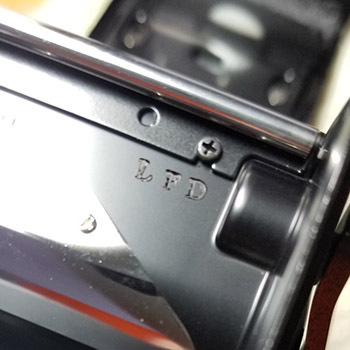 The nameplate is a flap, which looks like it is re-cycled from the Yashica LM but is actually bigger, over a built in flash for flashbulbs (requires a 15 volt battery for this function only). The carcass, i.e. the camera body minus the lens assembly and electronic wizardry, is the same as other knob wind Yashica TLRs. 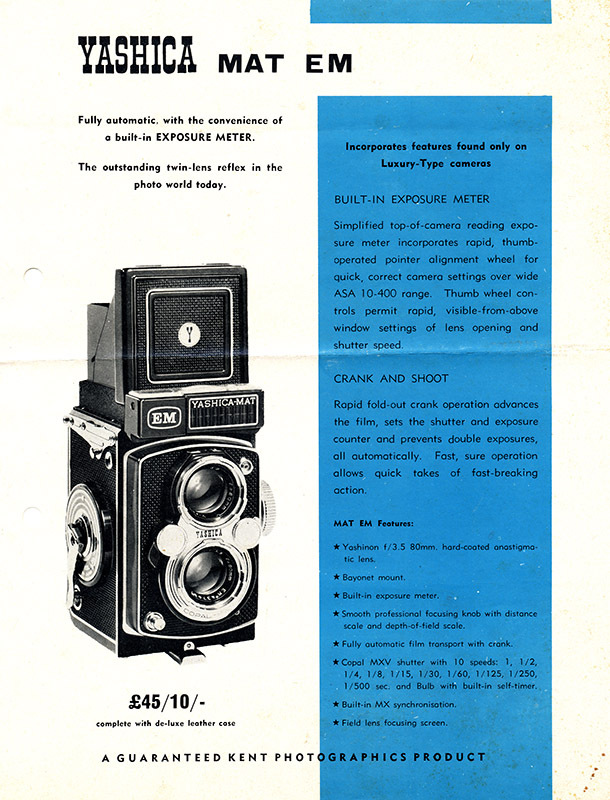 Note that whilst the single 1/60 shutter speed may seem primitive to us, it also helped to keep costs down for its target market (see table below) and a design imperative was to provide simple and reliable flash sync (it didn't have M/X switching for external flash options and Yashica probably wanted to keep bulb choices simple for the internal unit). The built-in flash was almost as much of a headline feature for its intended market segment as the automatic aperture. Filter size is standard 52 mm screw-in which conveniently also covers the selenium cell thereby providing automatic exposure compensation for different filter factors. A neutral density filter would be a very useful accessory for today's higher speed films. 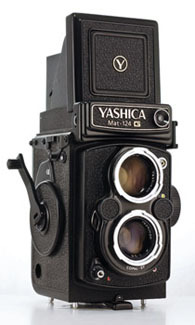 The Yashica E was also the only other model to use the extruded alloy accessory shoe commonly found on earlier export Yashica Ds. Claimed to be released in 1964, production may have only lasted a year or two. 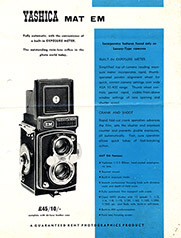 The Serial numbers range YE 3060xxx to YE 4070xxx suggests production from June 1963 to July 1964 but it does appear in a brochure with the Yashica 24 released in late 1965. The 1964 release date is quoted everywhere, but I have yet to find a reliable source reference, such as a Japanese magazine ad or article, to confirm that. Both Karl F. Kahlau's book, “Collector's Pictoral Encyclopaedia & Value Guide to 6x6 TLR Cameras” and the website “A Partial History of Yashica TLRs” quote Yashica/Kyocera as the source for a September 1964 release. However, thanks to assistance from contributer Göran Årelind, I can very confidently say that the release date was no later than February 1964 and quite possibly earlier. 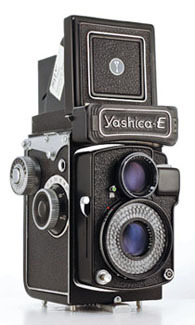 The Yashica E appears in at least two brochures with the Yashica Mat-LM. 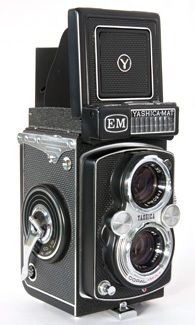 The replacement Yashica Mat-EM is claimed to be released in June 1964. This is a link to an English language TLR range brochure printed in Japan. The Yashica E appears in the April 1964 Swedish photography magazine, Foto, camera catalogue (courtesy of Göran Årelind). 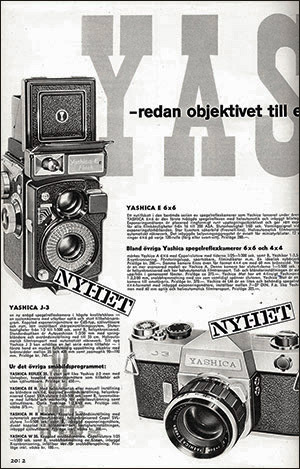 Note, “NYHET” stamped over both the Yashica E and Yashica J-3 SLR can be interpreted pretty vaguely but in this instance seems to imply “new product”. Some believe that the J-3 was launched as early as 1962 but so far, the earliest cameras in my database are from January 1963. I can't believe that both would be treated as “new product” if there was 12 months or more between them. Göran Årelind's fellow Swedish enthusiast, Per-Anders Westman, has also found an entry with photo and specs in a supplement added to Svensk Fotokonst's (Swedish Photo art) catalogue for 1963. This could have been distributed in late 1963 or early 1964 so is not definitive but given magazine publishing lead times etc for even the February 1964 references, a 1963 release would have to at least be considered possible, if not probable. As the claimed September 1964 release date has been comprehensively blown out of the water by at least 7 months and I am confident saying that production of the camera started in June 1963, in my view, the evidence suggests that release was almost certainly in 1963 as well. In view of the release date anomalies, the claimed end dates by the two sources of September 1964 for one (same date quoted for release and end dates!) and August 1966 for the other are very doubtful on a number of levels, although the September end date is tantalisingly close to the production end date predicted by the last serial number found. Whilst the last camera in my database was made in July 1964, clearly there could have been either a planned or unplanned large inventory of stock and its appearance with the Yashica 24 is not overly surprising to me. 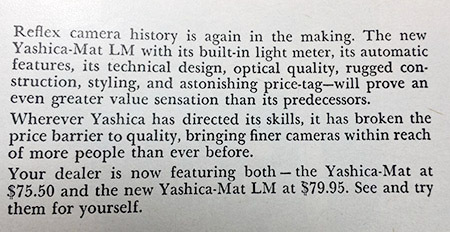 Earlier, in similar circumstances, the Yashica YE Leica copy seemed to end production in mid-1959 but was still being advertised in a brochure for the Pentamatic II released in September 1960. 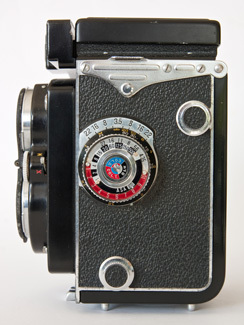 Franke & Heidecke released the automatic aperture Rollei Magic in late 1960. Although apparently based on the Rolleicord, it still has impressive specs including crank wind and four element Xenar lenses top and bottom, unlike most Franke & Heidecke models which have three element viewing lenses. The reason for this is that focusing is by the lens front cell only, the front panel does not move and therefore the lenses need to be identical, not just matched. In another sleight of hand, the control wheels no longer perform their familiar functions of shutter speed and aperture adjustment. Facing the camera, the left wheel is now film speed and the right wheel is the focusing adjuster. 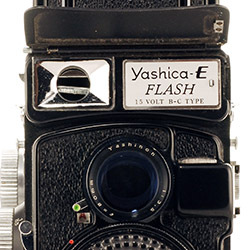 Unlike the later Yashica E, there is no built in flash but the big advantage is that shutter speeds are variable. The downside is that there is no manual over-ride on the first model. 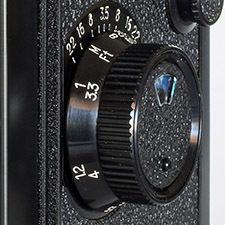 The Rollei Magic II, with manual control possible, arrived in early 1962. Neither set the world on fire. In Yashica Future 127, I detail Yashica's 1959 response to the automation push with its 127 format prototype and its first production application with the 1961 35 mm Flash-O-set. An updated Flash-O-Set II was released in 1962. This was an almost exact 35 mm equivalent of the Yashica E. There was also the 1962 Yashica EE which was more sophisticated (and more expensive) with a range of shutter speeds but then it didn't have to contend with the built-in flash. When Yashica finally revealed its TLR implementation of the new technology, almost reluctantly it seems to me, it had taken its time and offered no obvious improvements over its initial and unremarkable 35 mm effort. 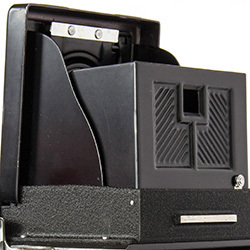 The Flash-O-Set technology was suspect, its application more so and the model's success was limited, why wait several years to release a TLR version with even less sales potential? Finding a market niche may have been a reason for the delay. 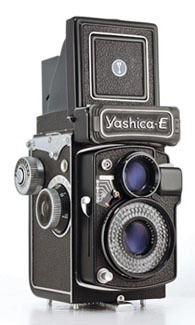 Perhaps the only reason to proceed was corporate pride to show that Yashica also could produce an automated TLR just as it could produce budget friendly knob and crank-wind models which were “good enough” for the intended market. The Rollei was an expensive camera with specs suited to well-healed enthusiasts that may have been willing early adopters of a technology we take for granted. Even so, the market was small for such a TLR and Yashica would have known that selling one of their budget cameras at a high enough price and volume to recover development and expensive parts costs was never going to fly. So the target seems to have been the novice looking for ease of use but not wanting to pay much extra for the convenience. Even with a limited lifetime, there were some variations. The first version had a plate marked with “Auto” and f/ stops to set aperture manually. 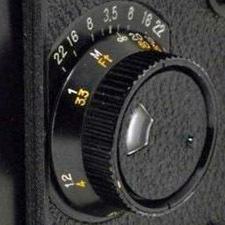 The “new” version, according to the assembly chart for this variation, had the aperture displayed in a window in place of the plate. Also, the flash sync socket moved from the top left corner, looking face-on at the camera, to the bottom right. 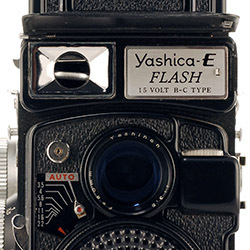 According to the assembly charts, the Yashica E could be bought for use with either “AG-1” or “baseless” flashbulbs, Yashica almost certainly meaning the older Philips PF1 “capless” type far more common in Europe. There are examples in my database of both original and “new” version Yashica Es with each of the two socket types represented . 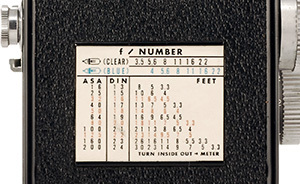 On the back of all versions is a flash exposure table on a card in a slide-out holder. The table has distance values in metres on one side and in feet on the other. Both clear and blue flashbulbs and DIN and ASA film speed scales are catered for. 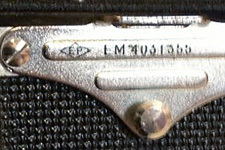 On the top of the flash housing is the hinge for the nameplate flap over the flash. 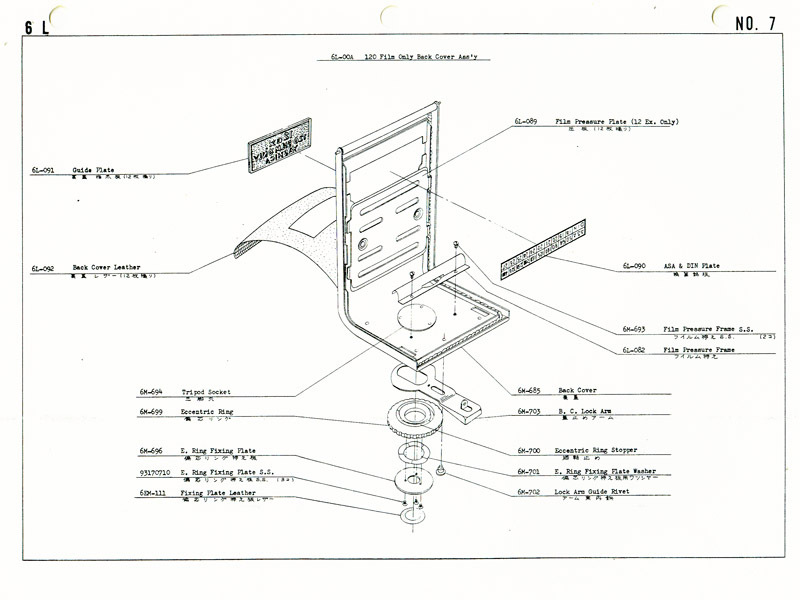 This has two screws and is sometimes covered by the metal “Hinge Dress Plate” referred to in the assembling charts. This is simply glued on and is often missing. Several cameras, seemingly random examples in terms of database order, have leatherette instead of the metal plate. The leatherette seems to match the rest of the camera and is accurately cut. Whether an original item or perhaps an official replacement item, is not known. The thirty six numbers in my database range from YE 3060xxx to YE 4070xxx. There are only six examples of the “new” version with aperture window, but oddly, the first, YE 3100xxx, is in the middle of the range - it seems likely to be a later camera but with older nameplate/flash assembly and hence, lower serial number. The next, YE 4010xxx, is the tenth last and even more strangely, its sync is back in the upper left hand corner. I think it is likely that it also has had the nameplate/flash assembly replaced. As for the sync socket, the front leatherette has been replaced and the sync socket seems to sit further into the corner than on other examples - I wonder if it has been moved from the bottom for some reason? The last four cameras, YE 4020xxx to YE 4070xxx, are typically “new” as expected. The example on the left is the earlier type with white on silver narrow “Y” hood logo which was unique to the Yashica Mat-EM (other models still had the blue background). The later one on the right has the wide “Y” and shiny control wheels. Production was from 1964 to 1967. Uses a similar meter set up to the Mat-LM but with easier to use interface (see below). Introduces a new square textured covering to metered crank wind models (Yashica 24, Yashica 12 and Yashica-Mat 124 followed with the same material). Viewing lenses do not have serial numbers anymore but remain f/3.2. On the Yashica-Mat, the DIN and ASA windows are used as a film speed reminder. 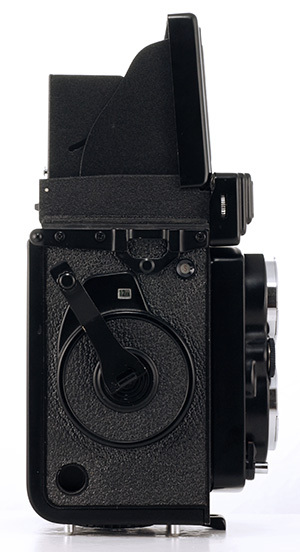 On the Yashica Mat-EM, similar to the later CdS exposure meter models, the film speed is set in ASA on a slider and window on the focusing side of the meter assembly (the CdS models use a window and wheel on the crank side) and the DIN and ASA windows on the focusing knob are used simply for converting from DIN to ASA (the CdS models eschew this function). Uniquely, the first twenty nine cameras in my database have their serial numbers engraved on the focusing knob side strap holder. The first camera is EM 4022xxx with taking lens serial number 439xxx, although the next camera has lower lens number 4022xxx. Some of the engraved numbers are difficult to discern. The last of these that I can read is EM 4033xxx with taking lens number 442xxx, although lens numbers get has high as 466xxx. The example below also has the <EP> mark. Camera EM 4034xxx (taking lens 454xxx) now has the serial number on the rear of the focusing hood like all subsequent examples and crank wind models. EM 4100xxx seems to be the first with the second type of plastic lens caps without the tab. There may be an earlier example with shiny silver control wheels instead of the mat silver domed type but most cameras seemed to change from EM 5060xxx. The hood logo changes from the narrow “Y”, to the wide “Y” of all later models with EM 5102xxx. The last camera is EM 7070xxx which has taking lens number 706xxx. This is the “first” with the parallel bars on the rear of the focusing hood finished in black instead of silver. It is original because of the obvious “EM” serial number and the 1967 year, by both claimed end date and by serial number, fits. 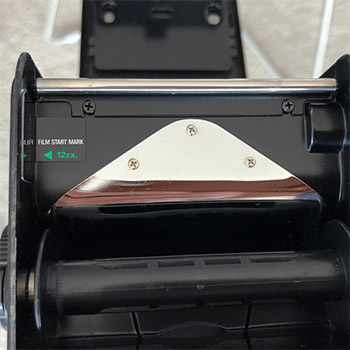 In normal trim, the 24 is designed to take 220 film, the 12 uses 120 and the Mat-124 takes both by removing and rotating the pressure plate 90⁰ in the first type and simply sliding in the second type (see further below). 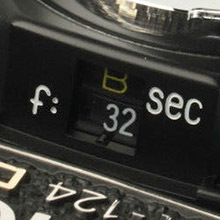 The position of the pressure plate also sets the film counter and 12 or 24 exposure reminder correctly via an extra tab on the plate in the 12 exposure position and a second pin next to the counter reset pin. 24 exposures, 12 exposures and 12 or 24 exposures; the source of the names is fairly obvious. Still basically Yashica-Mats with meter. Released in the above order in 1965, 1967 and 1968, these cameras are very similar and practically identical in appearance except that the 24 has an exposure meter switch on the left side and the other two activate the light meter by raising the hood and the Yashica 12 introduced a shutter lock and threaded cable release for the first time. The 124 grew its crank housing to incorporate a 12/24 frame reminder window. All three have identical aperture and speed coupled CdS light meters with match the needle reading and Yashinon /f2.8 viewing lenses without serial numbers. 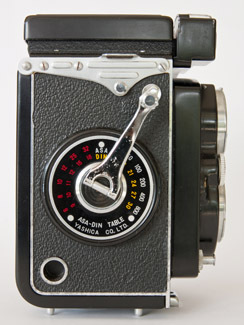 Showing the left side of a Yashica 24 and the unique red press-and-hold meter switch whilst the rest of the focusing side is common to all three cameras. Note the metal battery compartment cover compared to the plastic of the Mat-124G. 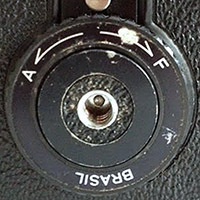 There is also no film type reminder inside the focusing knob as on the Mat-124G or film speed reminder of earlier models - the film speed is set in ASA on a dial and window on the crank side of the meter assembly. Apparently, the facility for converting from DIN to ASA by the expedient of using the Mat film speed reminder on the Mat-EM was now considered unnecessary. On the right is a larger image of the Yashica Mat-124 and detail showing the crank side 12/24 film reminder window and detail of the long overdue threaded shutter button and lock on both it and the Yashica 12. Covering is as for the Yashica Mat-EM, they have unique control wheels with concentric black and white rings and the “improved” Copal SV shutter. The SV was, I understand, very similar to the MXV. One site has suggested it contained fewer parts, which seems likely as it uses only 5 aperture blades instead of the 10 in earlier Copal shutters. First seen on the Yashica 44 some 7 years earlier. However, the smallest aperture increases from f/22 to f/32. 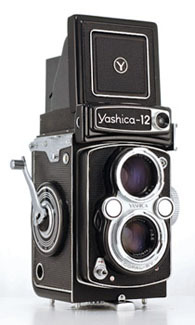 The Yashica 12 also initially featured the gold on silver scheme. 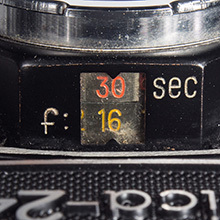 Between January and July 1967 for the Yashica 24 and in July 1967 for the Yashica 12 (probably July 1967 for both), the aperture scale changed to the new standard white numerals on black background (see also Control Wheels (Dial Knobs) & Exposure Indicator Window) for all models with control wheels. The release date of the Yashica Mat-124 is quoted as February 1968 but according to my serial number date code theory, the first ones in my database rolled off the production lines in October 1967 with production really cranking up in December. Release may still have been February. Be that as it may, but cameras with serial numbers starting with 7 all have smooth black painted focusing hood blinds like all previous cameras back to the Pigeonflex. 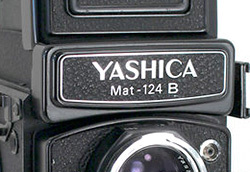 Early in 1968, the paint finish changed to a textured type on all models in production including the new Mat-124 and very last of the 1968 Yashica 12s. 1965 Yashica 24 on left, 1969 Yashica Mat-124 on right. These are also the first crank wind 66 models with accessory shoes. Some examples in the Yashica 24 user manual don't have one but all others I have found, do. The majority of Yashica 24s have 4 screws with the same size heads. The bottom right screw also secures the front of the strap holder plate and must be a problem because they are relatively frequently found with various larger headed screws. 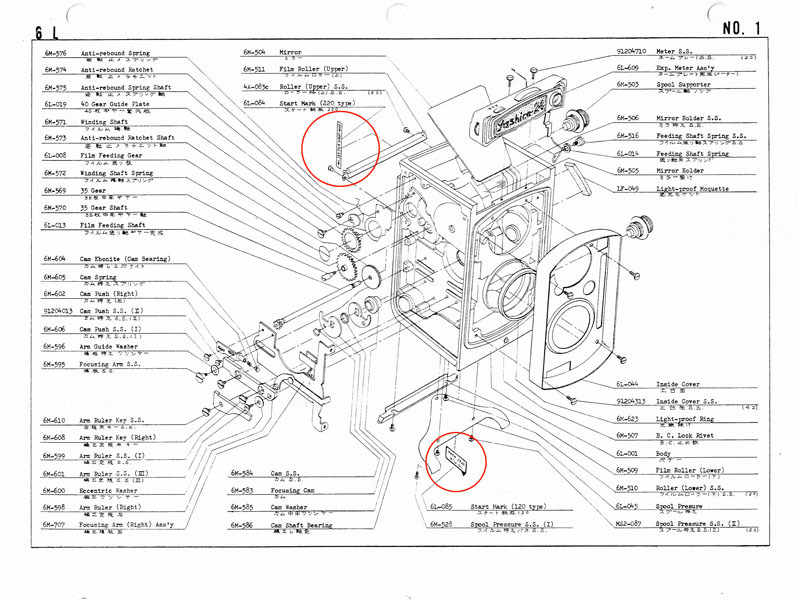 The factory moved to the larger headed screw, with the appropriate countersink size, around July 1967 which was towards the end of Yashica 24 production and the middle of Yashica 12 production (production overlapped). 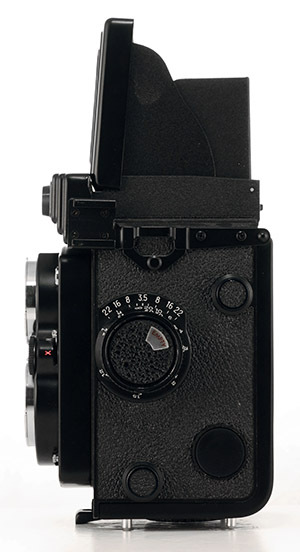 This initially continued with the Yashica Mat-124 but then, between July and December 1968 (serial numbers 8073xxx and 8121xxx), it changed to a smaller head which fits in between the two sizes. In the third image above, the screw head size barely looks larger in diameter than the other three screws but it is - the camera is sitting in front of me as I write. On the following Yashica Mat-124G, the bottom right screw reverted to the same head size as the other three, now cross headed (most probably JIS). Originally, these models (and the later Yashica Mat-124G) used 1.3 volt mercury batteries of PX625 (Eveready EPX-13) type. Some people now use PX 625A alkaline replacements but these are initially rated at 1.5 volts and then the voltage drops in a curve with time so near the end, the voltage will be below 1.3 volts. This obviously impacts the accuracy of the exposure meter in a variable way over time. The Wein zinc-air battery rated at 1.35 volts is a better solution. Like the original mercury batteries, it maintains a relatively flat voltage output throughout its life. 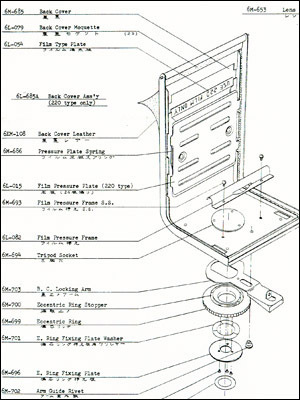 There is more detail on Yashica pressure plates and film channels here including Mat-124, 124G and 124B film type setting. The main difference between 120 and 220 film is that 120 has backing paper and 220 doesn't (except for the leader and tail) to get it onto the same size roll. The lack of backing creates handling issues but more importantly has an impact on the clearance with the camera's pressure plate which will be slightly less with a camera configured for 220 (but still allow for the backing paper at the leader and tail). My understanding is that the pressure plate shouldn't actually exert any pressure on the film if it is flat and therefore the clearance tolerance is quite fine. Running 120 film through a camera designed only for 220 probably means that there will be constant contact with the paper backing. 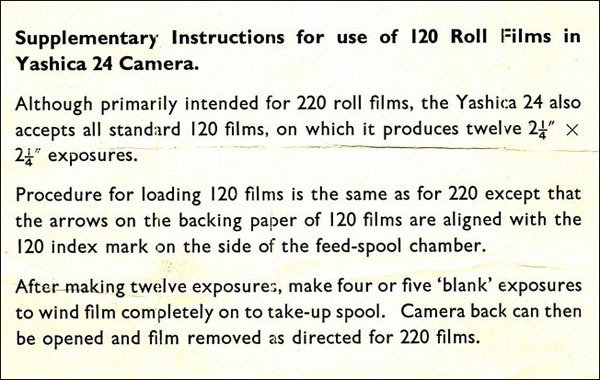 There are no indicators in the Yashica 24 user manual, or in advertising, that 120 film can be used or that any provisions have been made for it. However, there have long been seemingly credible claims by users that 120 can be loaded without problems. Most 24s checked so far, including the two lowest serial numbers in my database, L 5110xxx and L 5110172 (inside image below), and fourth highest (second last month of production), L 7100xxx, have an adhesive fixed 120 film start mark in the film chamber as well as the 220 mark in the lower back leading to the belief that it is designed to take both film types. Both cameras without the 120 start mark are in the middle of the range. It is most likely that all cameras were intended to have the mark. Normal, cast, red start mark triangle on both sides near the bottom of the back (all earlier 66 models with start marks, beginning with the Yashica Flex S, have this in the middle of the back). A sticker in the back identifying this as the 220 start mark. 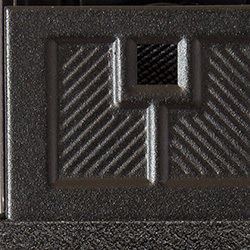 A sticker with integral start mark for 120 in the film feed chamber in the bottom of the camera. However, the story gets more complicated. 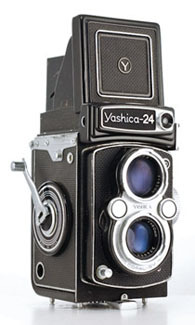 Until recently, I believed that to use 120 film, Yashica intended that the camera should be fitted with the special accessory back for the Yashica 24. The difference in clearance is only a very small amount but is enough to require separate pressure plate settings for the Yashica Mat-124 and 124G. 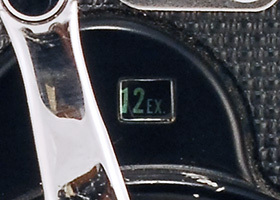 The 12 exposure back has an external warning label to use 120 film only (labels on all other backs, including the normal 220 back, are internal). 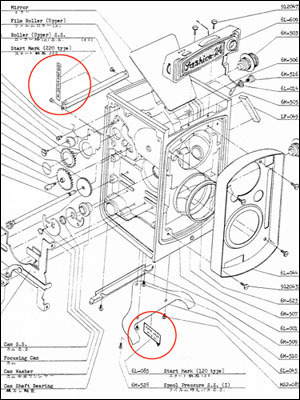 The special back is shown in Yashica 24 assembly charts and both Leigh Harris (thanks to Leigh for identifying this in the first place) and Tom Heckhaus have examples of the actual back. Note that the reason for the big external warning is that 220 film definitely can't be used with the 120 back. 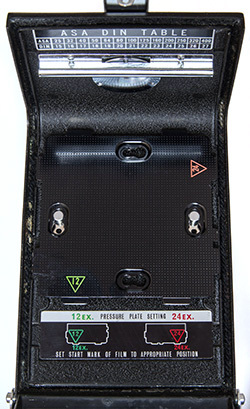 The 220 back has a shiny black enamel pressure plate because the film does not have the black backing paper. 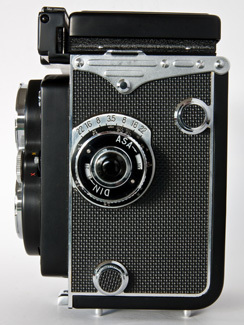 The pressure plate of the accessory 120 back is brushed aluminium as on previous models and also on the subsequent Yashica 12 and would likely causing fogging from light reflecting back through the 220 film. Also, the over-size clearance will not hold the film flat. Note also that the back is not suitable for use on other models. I say this because a site has these for sale advertised as fitting any model. Well, technically, there is nothing different about the back, it's the pressure plate which is unsuitable. 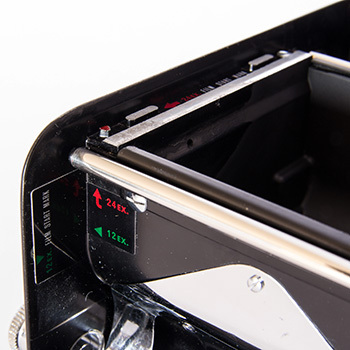 The four tabs on the pressure plates of all models sit on four machined “landing pads” moulded into the body (see Pressure Plates) which on other models are set at the correct height for 120 film. Since 1955, the tabs on pressure plates have been flat. 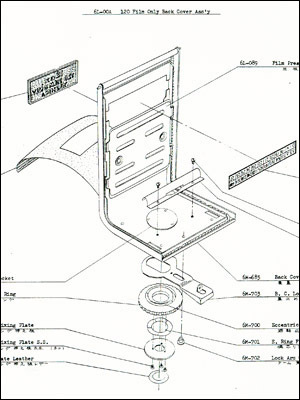 The “landing pads” in the body of the Yashica 24 have been machined to suit 220 film, i.e. to give less clearance. The special 12 EX. back has a pressure plate with tabs adjusted to restore the correct clearance for 120. 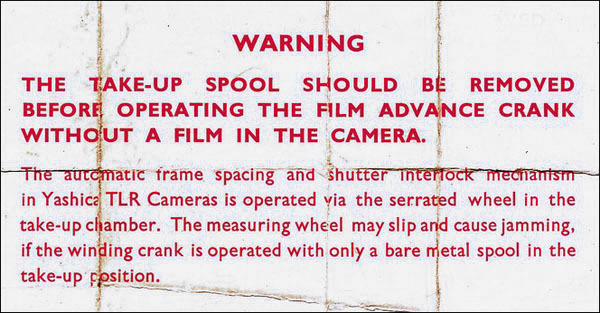 Used on any other model, the clearance becomes too great with the danger that the film will not sit properly flat. As there is no mention of special 120 backs, my interpretation is that perhaps after further testing or feedback, Yashica decided that there really wasn't any problem with using 120, despite that the label inside the back says, “USE 220 FILM ONLY”. Later cameras, at least the last third and maybe half, have the less strident “USE 220 FILM” but on the Yashica 12, the warning reverts to adding “ONLY” in respect of using 120 film - clearly, there appears to be a subtle difference in meaning between the two statements. 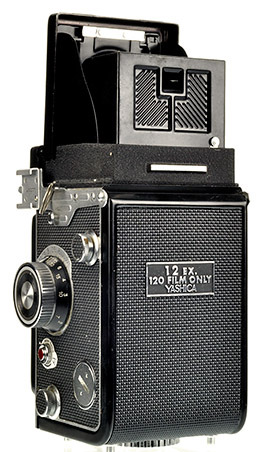 So both users and Yashica have determined that it is perfectly possible to successfully use 120 film without modification, however, clearly the special back is the optimal solution to match the film transport tolerances of other models including the adjustable Yashica Mat-124 and 124G. If you use a Yashica 24 to only shoot 120 and a 12 EX. back becomes available, it is worth considering. A couple of other tidbits about the 120 back is that inside, instead of a label specifying a film type, is a DIN to ASA conversion table. 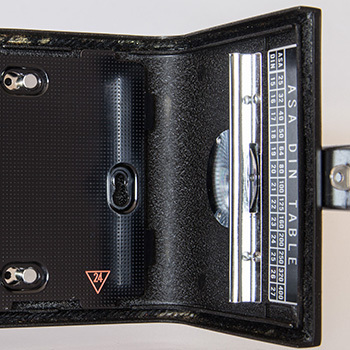 This must of been considered a good idea as the table also appears in the Yashica 12 (combined with film type warning), Yashica Mat-124 and early Yashica Mat-124G examples. Of the ten or so 120 backs that I have come across, two are from the US both bought by contributor Tom Heckhaus as “new, old stock”, one from Canada, one from France, three from the UK and three offered for sale in Australia also as “new, old stock”. To put this camera into context, it was targeted at professionals, at least that is what the advertising implies. 220 film was very new, also just released in 1965, and promised more shots which is something that pros would have been asking for, although there were handling problems and the available range never lived up to expectations. Yashica's top 120 camera at this stage was the Yashica Mat-EM, released just a year earlier and both in production until 1967. Perhaps Yashica's original strategy was that both formats were covered without the need for making the Yashica 24 dual format friendly, maybe thinking that the EM would suit the amateur market more. Then the Yashica 12 was released, effectively replacing the Yashica Mat-EM for those that preferred 120 and finally, the sensible solution arrived, the Yashica Mat-124, which could handle both formats efficiently. The Yashica 12 uses the new low-set cast red triangles of the Yashica 24 (220 marks on that camera) for 120 start. There are no other marks. 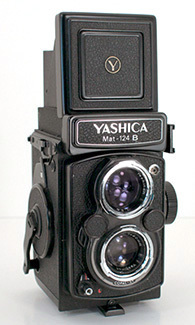 The Yashica Mat-124 (and also Yashica Mat-124G) reverts to the Yashica 24 arrangement of the low-set red triangles for 220 and a label in the film feed chamber for 120 start. However, this is of a new type with a green triangle and the red/green colour coding is also used for setting the pressure plate correctly (see also below). The first casting change was the removal of the the right side red painted cast triangle for 220 film start between camera serial numbers 9110xxx and 9112xxx (November 1969). Why go to the trouble? Perhaps there was a minuscule cost saving per camera but the main reason is likely to be that 220 film was not proving as popular as anticipated by Yashica. 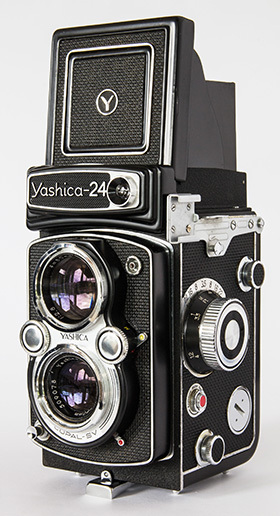 The Yashica 24 committed fully to 220 and the ability to use 120 seemed to be an after-thought and unpublicised. Therefore it probably made sense to reserve the pair of main start marks for 220 with an adhesive label hidden away in the bottom for 120. The Mat-124 continued with a similar system but as it became obvious that 120 would remain the prominent format, it probably appeared a little odd to give prominence to the 220 mark. Or perhaps Yashica thought that someone might use the right-side mark without noticing the “12 EX.” label on the other side. This solution was no doubt cheaper than adding an extra label. 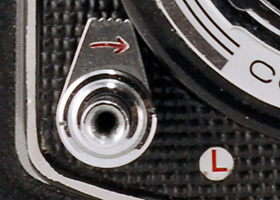 The pressure plate change required the cast-in and machined elongated round ended “landing pads” (seen in the start marks photo above) to change to the shorter, square ended ones commonly found in the subsequent Yashica Mat-124G (see Pressure Plates). Another change that occurred at about the same time is that the film guide at the bottom of the camera back near the “ASA DIN TABLE” (top of above two photos) changed from chrome plated to black. On the Mat-124G, the guide was replaced by the roller from the Yashica 635, however, the last Mat-124 in my database, 0081xxx, looks like it also may have the chrome plated roller already. That would suggest that the change to black was not a success for some reason. 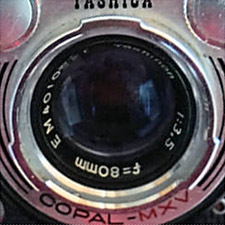 Whilst the plastic lens caps of all three models look the same (shared with the Yashica D, 635 & Mat), there was a change in mid-1967 from the serif font for “Yashica” to the modern sans-serif font, see Lens Caps (Soft Plastic) and the 2nd and 3rd examples. The eighty two Yashica 24s recorded in my database range from L 5100xxx to L 7111xxx with lens numbers ranging from 508xxx to 781xxx. The last ten have black bars on the rear of the focusing hood. The thirty nine Yashica 12s range from R 7020xxx to R 8050xxx. 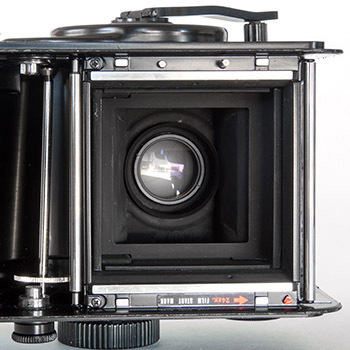 The fact that at least the first third and maybe half of cameras have silver bars on the focusing hood (the rest are black) and the lens numbers 671xxx to 779xxx are in the same range as the second half of Yashica 24 lenses confirms that the two models coexisted for a time. Only 1978 Yashica 12 lens numbers are higher, two examples are 797xxx and 801xxx. Both models appeared together in a 1967 US brochure. Eight cameras have plastic lens caps as noted for the Yashica 24. The one hundred and forty five Yashica Mat-124s range from 7100xxx to 9122xxx (to December 1969) and then start again from 0010xxx (January 1970) and run to 0081xxx (note, no prefixes but numbers still follow earlier patterns). Lens numbers run from 776xxx to 985xxx. All have black bars on the rear of the hood. Locking knobs are still all chrome. The Yashica Mat-124G represents the culmination of Yashica TLR development. 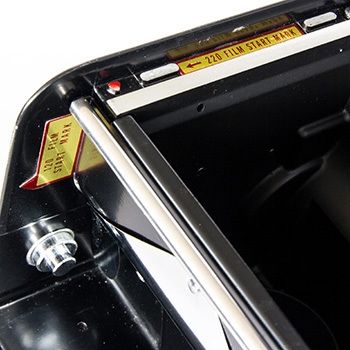 Although there were real improvements, it is characterised as a Mat-124 with gold plated meter contacts (hence the “G”), most bright work, except the Bay 1 filter mounts, name and hood logo, painted black and plastic replacing some metal bits including the locking knob on the base and the battery compartment cover. Some items such as the strap holders, crank and shape of the crank housing extension for the 12ex./24ex. reminder window underwent cosmetic “modernising”. 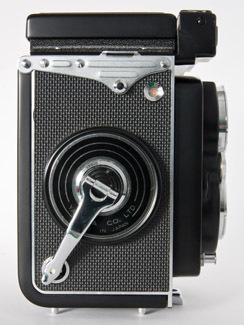 The leatherette covering reverted to the more traditional leatherette style of earlier cameras. Whether cost cutting was an aim is hard to know but whilst Yashica managed to make the camera look like a product of the 1970s, the earlier cameras looked more substantial. Released in 1970, by reputation, the closer the cameras got to the end of their production run in 1986, the coarser the operational feeling. I don’t know whether this is a fair assessment or not but how much coarser and relative to what? The operation of my 1979 example feels superior compared to my earlier crank-wind examples. Is this just another web myth? There are some claims that production finally ceased in 1986 simply because the moulds and dies wore out but by that stage, the market for TLRs must have been minuscule. Certainly, anyone buying a Mat-124G today should be far more concerned by overall condition than whether it is early or late production. 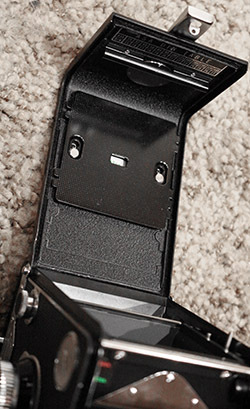 Note that the Yashica Mat-124G and 124B (also 1970 or later Yashica D and 635 examples) use cross head screws for the accessory shoe and strap holders (also the late Yashica-Mat) which are almost certainly Japanese JIS standard rather than Phillips - tight screws can be damaged by a Phillips driver. The same applies to any cross head screws inside. The models with coupled CdS exposure meters did not require a separate film speed reminder (ASA value set by thumb wheel on meter housing side - see right image below) and eschewed the need for converting from DIN to ASA (other than by a label inside the camera) but the Mat-124G saw a return to film type reminder inside the focusing knob e.g. “B&W” for black and white film, “Day/N” for daylight balanced colour negative film and so on. First, lets get rid of some myths. There are no plastic gears, at least in the examples that I have seen torn down. The crank-wind on my 1979 124G is much smoother and quieter than my Mat, Mat-LM, Mat-EM, 24 and Mat-124. Admittedly, the 124G seems to have had very little use and we are talking about just one example of each, however, people on forums that claim that the 124G is coarser than some other model are also often talking about one sample, certainly not many. There were at least two significant improvements over the Mat-124; one concerning reliability and the other image quality. 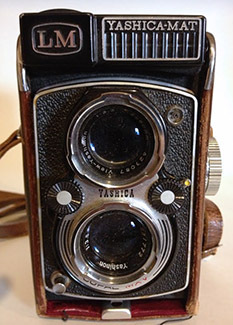 The exposure meter switch operated by the focusing hood was changed from the Yashica 12/ Yashica Mat-124 type plus the gold contacts were added. There are claims of unreliability with the earlier version. 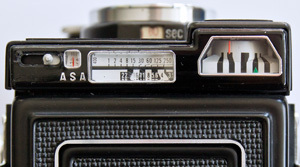 For exposure meter batteries, see the Yashica 24 et al entry above. The photos also show the differences between the two models regarding pressure plate setting. 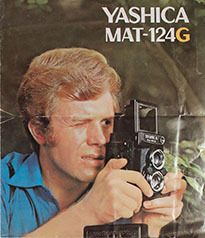 Many people believe that the simpler sliding arrangement of the pressure plate compared to the slide to remove and rotate of the original Mat-124 was introduced by the Mat-124G but in fact that arrived in the the last 6 months of Yashica Mat-124 production (see Mat-124 above). Finally, the Yashica Mat-124G saw the introduction of “modern” foam light seals for the camera back. All previous models use black yarn (visible in the Mat-124 back above left) which rarely, if ever, needs replacing. The foam of the 124G invariably has to be replaced, if not already done. Cameras that have sat for a long time may have the back “stuck” to the body. The seals for the exposure meter may also need to be replaced (applies equally to the preceding CdS models). The next change is internal and is the deletion of the DIN to ASA conversion table at the bottom of the camera back which had carried over from the Yashica 12 and Yashica Mat-124. This occurred sometime between camera 2081xxx and 3016xxx (between August 1972 and January 1973). Taking lens serial numbers disappeared in February 1975 (camera 5020xxx) but there is one March and one April example that still have them. This occurred between serial numbers 91002xx and 91007xx in October 1979. Both types are plastic. A word of caution - they are a dating indicator but covers get lost and maybe replaced by a different type. There are two completely different blocks of serial numbers, one with 7 digits as for the previous 10 years and the other with 6 digits. Unlike with most earlier series, there is less help from trim changes or comparable models to help put things in order. This is my interpretation. 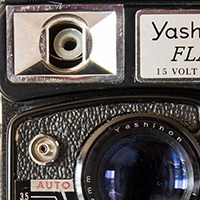 Since about 1964, Yashinon viewing lenses on any model were unnumbered. For the first time (except for the Yashica E), over half of the taking lenses are also unnumbered. Because of previous practice, the numbered lenses would, I assume, come first. Therefore, the first sequence is 7 digit numbers 0091xxx to 0120xxx (September to December 1970) with lens numbers 990xxx to 1030xxx and these conveniently follow on from Yashica Mat-124 numbering. The next sequence is 1040xxx to 4120xxx (in reality, contains separate sequences for 1971, 1972, 1973 and 1974) with lens numbers starting anew from 702xxx and rising to 1171xxx, apparently side-stepping the earlier 7 digit lens numbers and 6 digit numbers starting with “9”. The lens numbering had become very messy but could have carried on from that point. 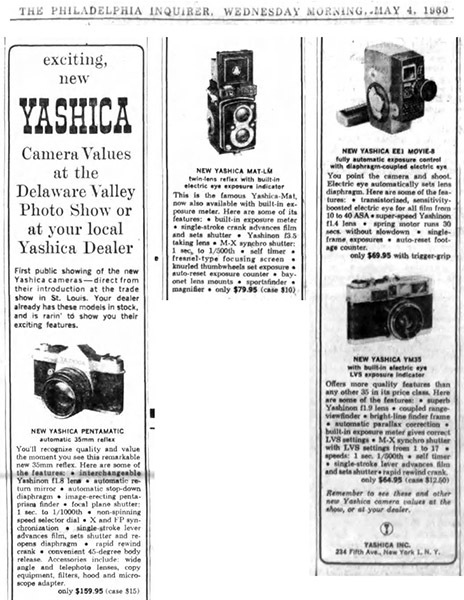 However, Yashica decided that the following cameras would no longer have taking lens serial numbers. The body serial numbers continue the sequence with 5020xxx to 9123xxx (February 1975 to December 1979). These 7 digit numbers continue the pattern of no 2nd digit (from the left) being higher than “1” so I am confident of the date code still applying. The last sequence of the first block of numbers is 0021xxx to 0042xxx (February 1980 to April 1980, see Serial Numbers page). The final block is 6 digit numbers from 051xxx to 235xxx. 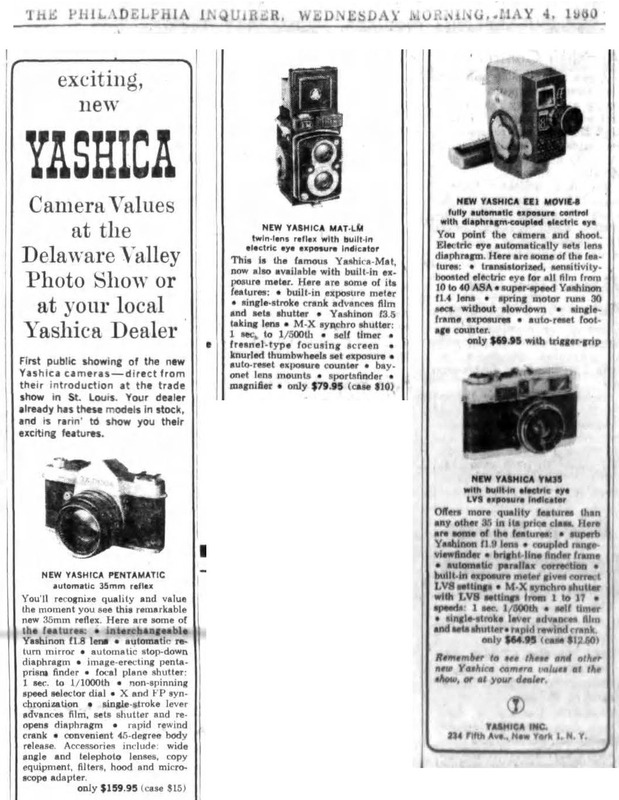 My guess is that Yashica saw the problem of repeating numbers coming, especially when the 1970 and 1980 cameras looked almost identical, and changed to a new 6 digit series instead. These numbers appear to be simply consecutive without any obvious code. The two photos highlight another mystery. The mount for the roller in the right image shows an extra, unused hole - there is another matching hole at the other end. The holes started appearing at similar time to the codes, maybe a fraction later and are there to the end without any obvious purpose being evident. Original ever-ready cases may also help with dating. 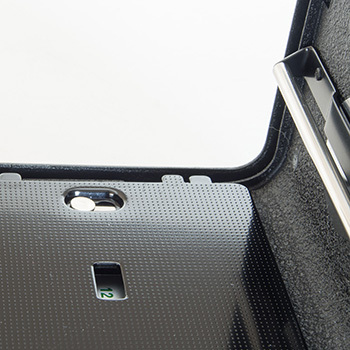 All have the same unique style with smooth tapered snout and cut away top (see Camera Ever-ready Cases). There are three front half variations, the most obvious changes being the nameplate style, and two back half variations but the second front initially used the first type back half and then the second type back half giving a total of four case variations. The first type front half has glossy leather and silver nameplate with recessed black letters and border. 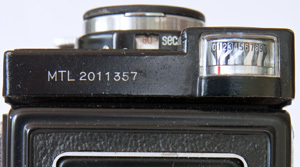 The second type front, starting with cameras around the 6120xxx mark (there does appear to be a transition period of both), appears more textured and has a black nameplate and raised silver letters and surround. The third type, starting near camera 106xxx of the final 6 digit series, uses a matt, synthetic material with raised silver letters in a recessed panel in the case. The left example was found with a December 1973 camera and another belongs to the earliest Mat-124G in my database. The right belongs to a 1976 camera. 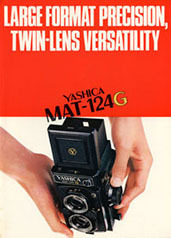 The Yashica Mat-124G page below is from a Japanese brochure . Camera with lens serial number and close-up lenses with chrome bezels date this from early 1970s. Quoted prices are; camera 36,000 yen; ever-ready case 1,500 yen; telephoto lens set 7,000 yen; wide angle lens set (not shown) 6,500 yen and No. 1 & 2 close-up sets 2,400 yen each. The US price for a Yashica Mat-124 in 1968 was “under $100 plus case”. The first (left) brochure below is printed in West Germany in English with only US addresses listed. Opens out to double sided poster size. The main featured camera has serial number 0054398, which translates to May 1970, and also appears in the first type user manual with “66” on the cover. Production seemed to get underway around September so likely to be an earlier brochure. Correspondent Jim Hurtle says he obtained it from a camera store in the late 1970s. Includes useful information about auxiliary and close-up lenses. The second (right) brochure below has the Kyocera Corporation listed on the rear as the contact for Yashica and is printed in Germany in English. A later version has identical content but more Kyocera addresses on the rear and the orange on the front is replaced by blue with a gold band on top with “Kyocera” and is printed in Japan in English. As Kyocera acquired Yashica in 1983, I am assuming the brochure below is also from around that time. The camera in the brochure is 073358 which is after the last 1980 7 digit number. None of the cameras I have seen so far have lens numbers (like later Mat-124Gs) and all have the later Mat-124G slotted battery compartment covers so I would say that they are definitely from 1979 (after the first 35 mm camera with “Brasil”) or later, although Wikipedia claims 1975. Unless I haven't picked up any earlier cameras, I think Wikipedia is incorrect. My database has twenty two serial numbers from 061xxx to 168xxx. Compared to 124G serial numbers, these would start in 1980, but noting the shipping delay I have suggested below, 1981 is possible. The Yashica/Kyocera Battery Chart says released in 1981, that looks like a pretty close match. I hasten to add that both 124G and 124B serial numbers appear to be consecutive. The comparison of numbers only works if it is assumed that the 124B uses 124G serial numbers. To me, it looks like they do, 124G focusing hoods were probably shipped to Brazil pre-stamped. That may also explain why the change to the olive on black shutter speed scale in the exposure window occurred between serial numbers 157xxx and 161xxx for the 124G and 143xxx and 146xxx for the 124B. The highest serial number is probably from late 1983 or 1984. There is a little more background here. Thanks to correspondent Tony Kwong for alerting me to the existence of this model.